A whole new way to discover the fantastic Fraser Coast! A visit to Queensland’s Fraser Coast – host of the CMCA Anniversary Rally in April, 2013 - has just got even more exciting, interactive and engaging. This summer the Fraser Coast launches a brand new attraction – the Fraser Coast Discovery Sphere. At the Fraser Coast Cultural Centre centre, located in Hervey Bay, visitors can be immersed in the incredible world of the humpback whale; be inspired by the uniqueness of World Heritage listed Fraser Island; and discover the outstanding beauty and diversity of the Great Sandy Biosphere. Fascinating interpretive panels and interactive displays explore the rare and endangered marine life of the famed Mary River and the ancestral origins of the macadamia nut. Woven throughout are the dreamtime legends of the Butchulla People as well as artwork celebrating and explaining the stories and traditions handed down over thousands of years. Highlights of the Centre include an immersive ‘underwater encounter’ with humpback whales and a full sized reproduction of a whale skeleton. A theatre experience takes viewers to a stunning, extraordinary and rarely seen side of Fraser Island and Great Sandy Strait. Children can get hands-on with natural discovery in a dedicated children’s section with storytelling and interactive challenges. An information kiosk and gift store provides information, trails and brochures to continue the Fraser Coast experience and the opportunity to purchase locally made keepsakes and regional produce. Next to the Discovery Sphere, soak up culture and engage with the visual arts at the Hervey Bay Regional Gallery. This state-of-the-art public gallery showcases the creative talents of artists from within the region and artworks and artefacts on tour from major galleries and museums across the country. 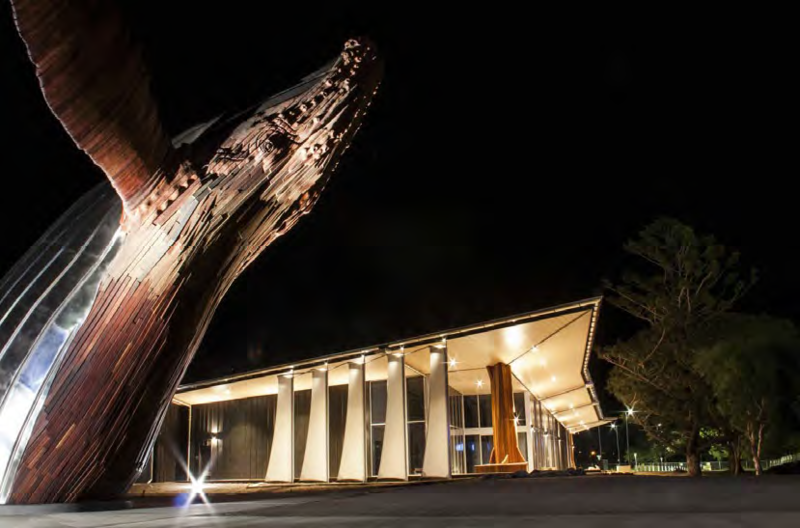 Outside the Cultural Centre, visitors can relax in the courtyard and view stunning public art, including a giant sculpture of a breaching humpback whale. Another way to explore, experience and enjoy the Fraser Coast is with the new Discover Fraser Coast phone app. The brand new free app is available for both Android and iPhone and is designed to take users to all the region’s famous attractions and unlock its hidden gems through a series of 12 trails. The phone app provides details and images for hundreds of points of interests around the region, which includes the heritage city of Maryborough and coastal centre of Hervey Bay. Use maps and the ‘Around Me’ function of the app to find the closest dining, accommodation, attractions and tours, and there are a number of exclusive deals just for phone users. Use the app to find and scan special codes located at key points of interest around the region and unlock a number of rewards – from free entry to museums and attractions, to small mementoes. For a free download go to www.ourfrasercoast.com.au/phone-app. For more information on the Fraser Coast go to www.visitfrasercoast.com.